You know the saying "it's always the quiet ones"? It's something that people mutter once they realize the potential for quiet people to be both dangerous and volatile. We never expect the quiet people to fight back; we never think that they will be the ones to snap at you in anger. We never expect that the people who are harboring so much darkness are often the ones who appear the happiest and brightest. Conversely, we always expect the villains to be just that -- dark, cruel, cold-hearted villains. We never anticipate them to have the same fears and desires as we do. 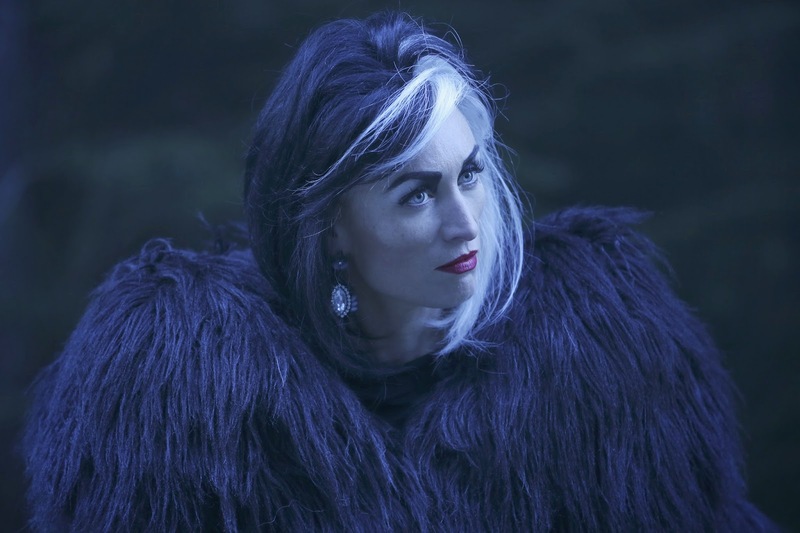 But "Darkness On the Edge of Town," Once Upon A Time's most recent episode, reminded us of both of these facts: it presented us villains who (as we can see in the flashbacks) are terrible, evil, manipulative women... but who also can be self-sacrificing. It also presented us with a person who we typically view as a hero who -- in reality -- has darkness in her heart. So let's talk about our return to Storybrooke, shall we? As we know from "Heroes and Villains," Rumplestiltskin/Gold was banished from Storybrooke by his beloved Belle after she discovered all the ways he lied to and manipulated her. But lest we forget, this is The Dark One and he plans to get his happy ending, whatever the cost. Happiness and goodness are not, apparently, mutually exclusive in this world because Rumple enlists the help of Ursula (whom he's staying with, apparently, in New York) and Cruella de Vil in order to get back to Storybrooke. I'm not sure how I feel about Rumple at this point except certain that his manipulative ways and his lies have bitten him before and they will surely do so again. This time, Rumple is not just convincing Belle of his devotion and honesty; he's not trying to sway an entire town into believing that he's a reformed man, in desperate need of love and forgiveness. No, this time, Rumple is playing with fire in the form of three very powerful, very dark villains. I think that Rumple genuinely believes that the ends justify the means -- that no matter how he manages to achieve his happy ending, he will get it. And I think that's the central question of this year's installment of Once Upon A Time, really: can you get a happy ending if your heart has darkness in it? Or are you doomed, because of your mistakes, to a life of unhappiness? And I think that what the series has done with episodes like "Heroes and Villains" and "Darkness On the Edge of Town" is provide a stark contrast between those whose hearts have been touched by darkness and who have reformed their ways and those who have not. Redemption is achieved because you rescue yourself from darkness or someone else does and they drag you into the light. That's why character like Regina are so complex -- she doesn't know if she deserves a happy ending, but she wants to seek it out and the method by which she does so is noble and honorable and exemplary of a hero's reformed heart (self-sacrifice being the key there). Rumple, conversely, and the Queens of Darkness don't want happiness so much as they want selfishness -- they want to get everything they want without having to change any part of them at all. But the Queens aren't entirely dark and it's telling in the flashbacks when Rumple leads them into a trap guarded by an actual demon who feeds on darkness. What a perfect place for the trio to be in, right? And yet, what I found so fascinating about that scene was that the women worked together in order to fight the demon. Moreover, Maleficent enacted a plan in order so that two of the three of them could escape. And she knew, of course, that she would be the one the beast wanted most of all because she had the darkest heart. So she was willing to sacrifice herself and put up a fight. But then Ursula rescues her. Instead of running and saving themselves, as we would expect them to do, Cruella and Ursula actually stay to rescue Maleficent. I don't know about you, but that's pretty telling, isn't it? Maleficent may have the darkest heart and she may be evil (as are the other two), but that doesn't mean they don't have shreds of humanity left within them. Ursula and Cruella manage to get into Storybrooke, thanks to a very intricately-detailed plan of Rumple's, because they offer help to Regina and Emma on how to defeat the demon that escaped from the sorceror's hat with the fairies (yes, the fairies were released. Huzzah!). It's pretty clear that at the moment, they don't want redemption: they want revenge. And boy is there a difference. One leads you towards happy endings; the other leads you down the path of darkness. When we find out that Emma Swan's heart is what the demon is after, not (as everyone suspected) Regina's, you might be a bit stunned. Emma Swan is the savior. She's one of the good guys. She's the one with light magic, who swaps coffee and kisses with Hook, who smiles and laughs and makes jokes. In fact, in "Darkness On the Edge of Town," everything seems to be going really well for Emma in Storybrooke since Rumple left. She's happy and -- this is important -- she is actually ALLOWING herself to be for the very first time. Her scenes with Hook in this episode are telling, too: when he can't see past his guilt for trapping the fairies in the hat in the first place, Emma reminds him that he's not a villain. He's a hero. He's the person who helped save them and he's not a product of his mistakes or his past deeds -- who he is? It's defined by what he does next, not what he did. And Emma genuinely loves Hook. She loves all of him -- all of his broken, dark, shattered pieces -- even when he can't love himself. That's what is so beautiful and so wonderful about their relationship, really: they never stop fighting for each other and for happiness. So while Emma is encouraging and trying to help Regina find her happy ending by locating the author/sorcerer (who we learn are actually two different people. Thanks, Blue Fairy! Don't know what we did without you! ), it seems rather jarring to end an episode by Rumple explaining to the Queens that Emma has the darkest heart. I think so much of Emma is wrapped up in who she was and who she could become because of who she was. Hear me out, momentarily: Emma is scarred. She's broken. She has had a lot of bad things happen to her throughout her life and any one of those things could have very well changed her into a villain, not a hero. Her heart has a potential for darkness because it's tainted by dark stories and dark deeds. Moreover, as we see in this episode, Emma's parentage isn't exactly as snowy (ha, ha) as everyone believes: Charming and Snow harbor some pretty dark secrets and as much as we don't want them to, secrets and lies trickle down through our lineage. Emma may be the savior, but it doesn't mean she's pure and it doesn't mean she's blameless and heck, it doesn't even mean that she's good, necessarily. But what I believe about Emma Swan is what I've always believed about her: she's vulnerable. She's fractured. She's trying to make herself feel whole again and in order to do so, she's going to stumble and try and find her own happy ending. Right now, she seems to have one with Hook. She seems to have actually allowed herself to tear down those walls around her heart and love and laugh and FEEL again. something that has been missing since before Neal died. And if Emma Swan has the darkest heart in Storybrooke, it's also because that darkness is dormant, for the time being. She's chosen the path of light and the path of goodness and the path set forth for her by Charming and Snow and Henry. The thing about dormant volcanoes is that they look really pretty and calm and perfect until they explode. Will that be what happens to Emma throughout the rest of this season? Will her dormant dark heart be awoken? Will the savior be consumed by her own pain and isolation and feelings of anger and bitterness that she's harbored within her for so long? Speaking of harboring, Charming and Snow confront the Queens at the edge of town (the title works in a lot of ways this episode) and Snow makes some pretty impressive threats. She's the one who didn't want Ursula and Cruella to enter Storybrooke. And the woman reminds them that if they so much as think of breathing a word of what happened between the four of them in the Enchanted Forest to Emma, she'll rip their hearts out of their chests and crush them herself. Sheesh. Snow doesn't mess around. Again, lest we forget: Snow's heart was tainted with darkness, too, and just because she's a hero doesn't mean she's pure. That should be the moral of this episode, actually: heroes don't always have pure hearts or pure motives; likewise, villains aren't always completely tainted by darkness even if they believe that they are. What defines us -- and what will define whether or not we achieve our happy endings -- is how we live and whether we're willing to sacrifice our own selfish desires. Or how we don't. Magical MVP for "Darkness On the Edge of Town" goes to Kristin Bauer van Straten for her portrayal of Maleficent, the darkest of all the female villains, apparently. I love not only her sass in the flashbacks, but also her decision to enact a plan that would save two of the villains and doom the darkest one of them all (she knows it's herself when the demon corners her). And I love that even though she wasn't able to verbally express thanks to Ursula for rescuing her, the woman doesn't seem to be completely and totally evil as she presumes. Kristin does such a great job balancing out her villainy and humanity and I love that. "I don't bow down to fish." "Well, I see you still have your temper." Can I just say how much I appreciated Hook/Belle bonding? Clearly they've been spending a lot of time together lately and I am a fan of their friendship. "Love how you underestimate me. Adorable." "You eat like a child. Is that root beer?" I didn't talk about it above, but I loved Regina and her sass this episode. She, Emma, and Henry are still searching for the elusive Author in order to get him to write her a happy ending. There seems to be little to no success on that front, until Blue returns and informs the group that the Author and the Sorceror? They're two different people. It's really weird that she knows that. Don't you think? I'm placing bets right now that Blue has something to do with one of them. At least more than she's letting on. "I'm a queen and a bit more refined." The fact that the entire group let a GIANT SMOKE DEMON into their world is pretty hilariously awful. How many times will it take for the group to learn that maybe they should check the magical object and make sure NOTHING ELSE COMES OUT OF IT THAT THEY WEREN'T EXPECTING. It's even more hilarious because the town's mayor and sheriff were both standing by, not noticing anything in their peripheral vision. Good job, heroes. Good job. "Lurking and brooding. That's a classic combo." "Surely the savior and the evil queen can defeat a simple hell beast." "Can we drop the e-word already?" "Well, this isn't our first monster bash." Hook, you're such a delight. "Is there a dwarf named Evil-y?" Did no one maybe think that Rumple was somehow behind Cruella and Ursula magically re-appearing in Storybrooke? I mean, what do they think happened to him? Was that ever explicitly stated? Because given how much they know about Rumple, I would think SOMEONE WOULD PAUSE AND ASSUME ALL IS NOT WELL. "I'm not going to let both of us die in this metal coffin on wheels." "Thank you, Regina. You won't regret it." "I better not." Can Snow and Charming be evil? I would like them so much more if they were. Looks like Maleficent is making her triumphant return and the villains are rightfully scared.